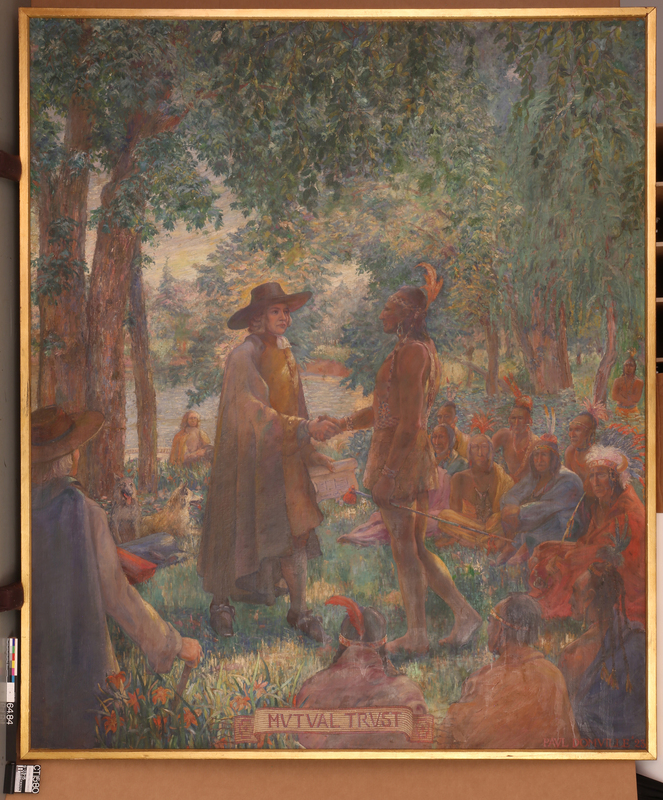 Mutual Trust was originally painted in oil on canvas by Paul C. K. Domville (1893-1977) in 1923 and installed in the Mutual Trust Bank and Office Building at 4th and Market Streets in Philadelphia. The artist was also the architect who had designed the building. 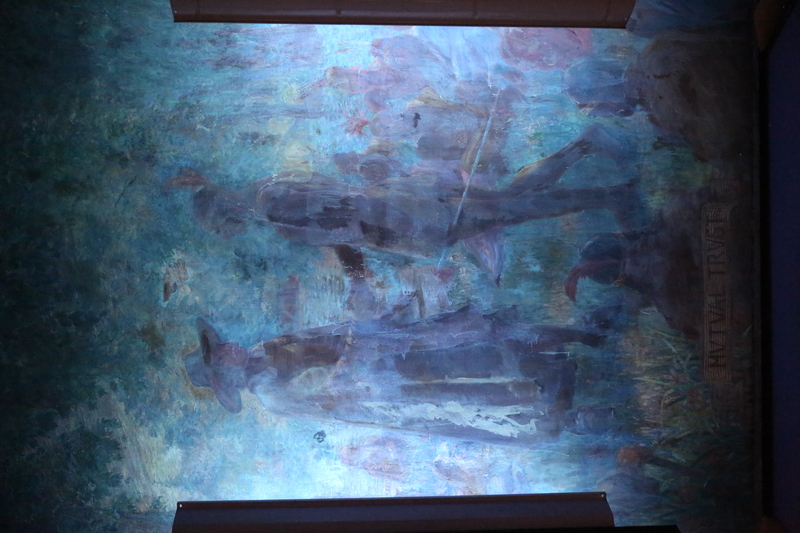 The Mutual Trust Bank and Office Building has since been demolished and it is unknown when the Commonwealth of Pennsylvania acquired the painting; however, it has hung prominently in the State Museum building since the museum was built and dedicated in 1965. 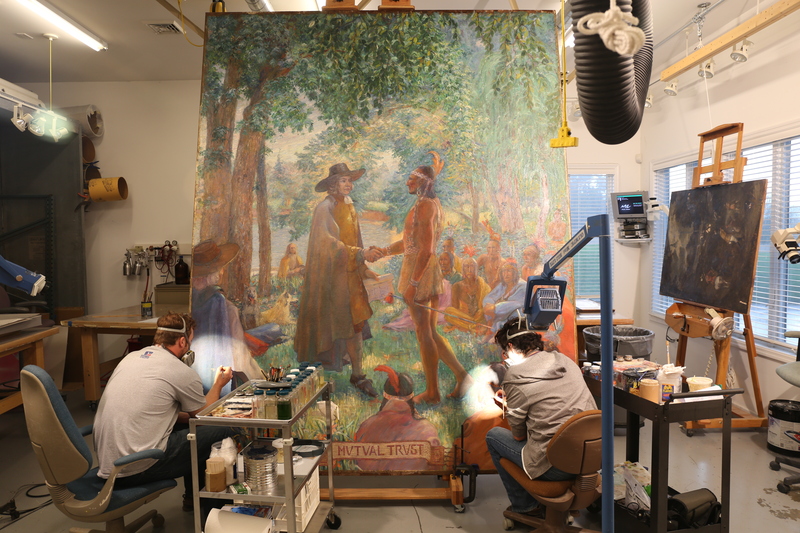 Conservation work was performed to prepare the painting for a 50th anniversary celebration and special exhibit at the State Museum on an emergency schedule. There is an inscription on the stretcher reverse indicating that the painting had been “relined on heavy canvas with a wax rosin formula and mounted on a new stretcher. Retouched and varnished in October 1960.” by Byecroft Studios in Holicong, PA. Before painting and restoring artwork at Byecroft Studios on his family’s estate, Arthur Edwin Bye was a curator at the Philadelphia Museum of Art, taught art classes at LaSalle College, and was a member of the Pennsylvania Academy of Fine Arts. His son was noted Philadelphia watercolorist and art teacher Ranulph Bye. The painting was executed in oil paints with a white ground layer on canvas and measured 121 1/2″ H x 95 7/8″ W x 1 1/4″ TH (approx. 10′ x 8′). The painting had a discolored varnish coating. The paint was thickly applied by pallet knife or brush in some areas and was thin in other areas. 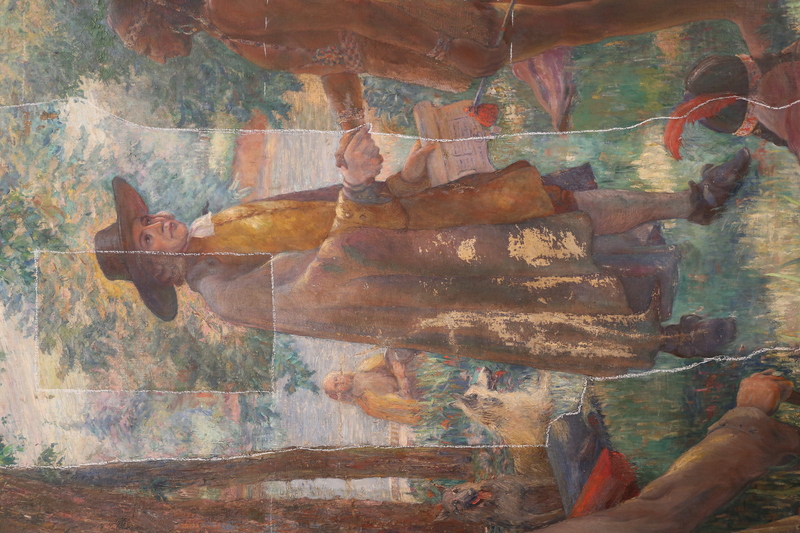 There was age crackle in the paint layer throughout the canvas. The canvas was taut on its stretcher. There was evidence of previous paint loss and overpainting without filling of isolated loss areas throughout the entire composition. 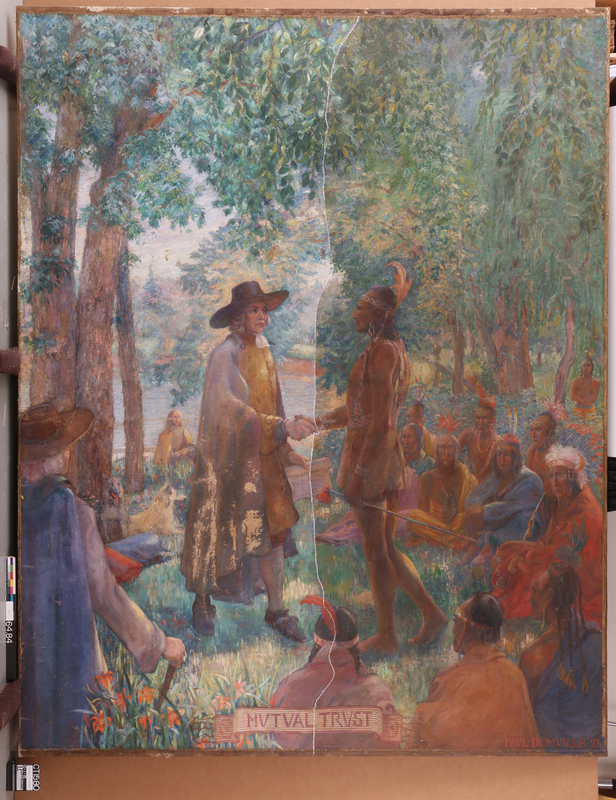 The painting was signed in oil in the viewer’s bottom right corner – “Paul Domville 23.” The title of the painting – “Mutual Trust” – was painted in large letters along the center of the bottom edge of the painting. The gilt wooden frame may have been original to the 1923 painting. it has hung in the State Museum since 1965. The joints in the corners of the frame were slightly separated. The leaf was flaking in isolated areas around the frame, with nicks, gouges, and dark stains also present along the outer edges. The painting did not have a backing board and was on a four-member stretcher. 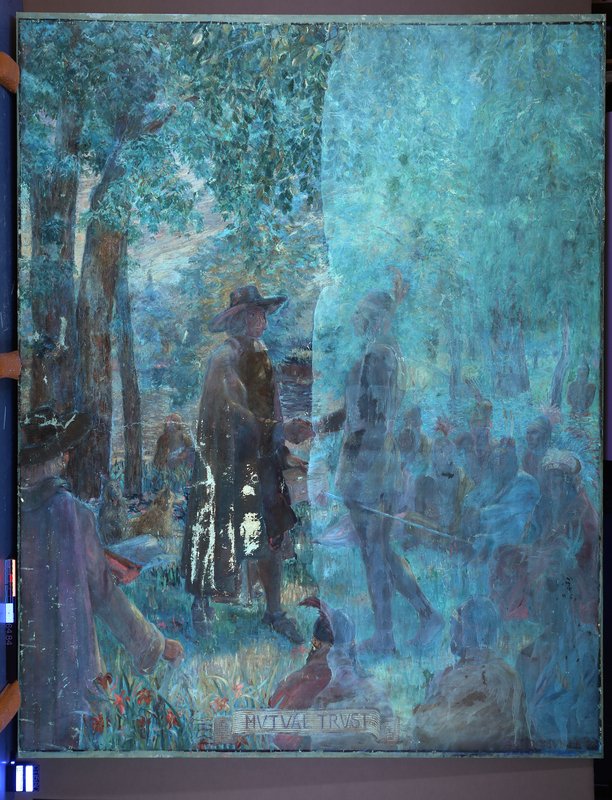 As mentioned above, the reverse of the stretcher had an inscription indicating the painting had previously been restored by Arthur Edwin Bye in 1960. 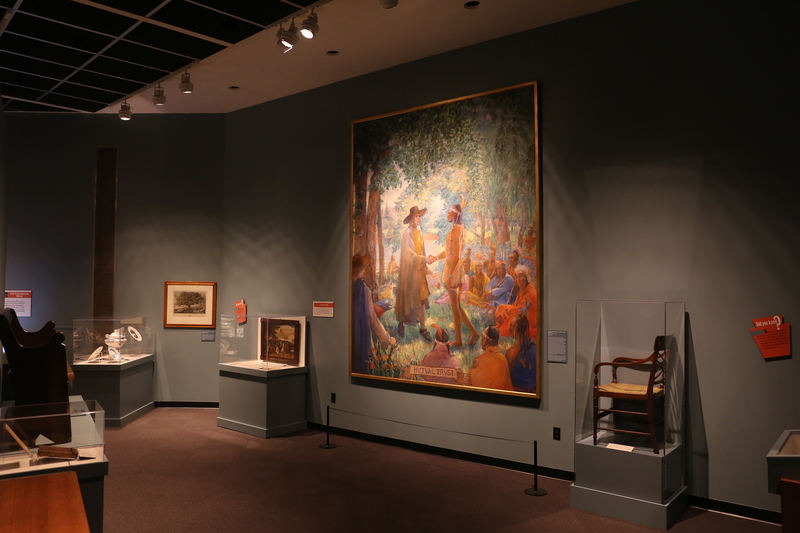 With help from the State Museum, Hartmann Conservation’s staff removed the painting from the State Museum wall, wrapped it in appropriate materials, and safely transported it via 26′ truck to our conservation facility in Carlisle, PA. The painting was unpacked and documented with written reports and photography before, during, and after treatment. All four frame pieces were removed separately. The painting’s discolored varnish coating and heavy dark embedded dirt was removed by applying denatured alcohol followed by an organic solvent mixture and solvent rinse. Heavy thick overpaint was also safely removed with a similar solvent mixture. In all instances, the overpaint covered surrounding original paint. 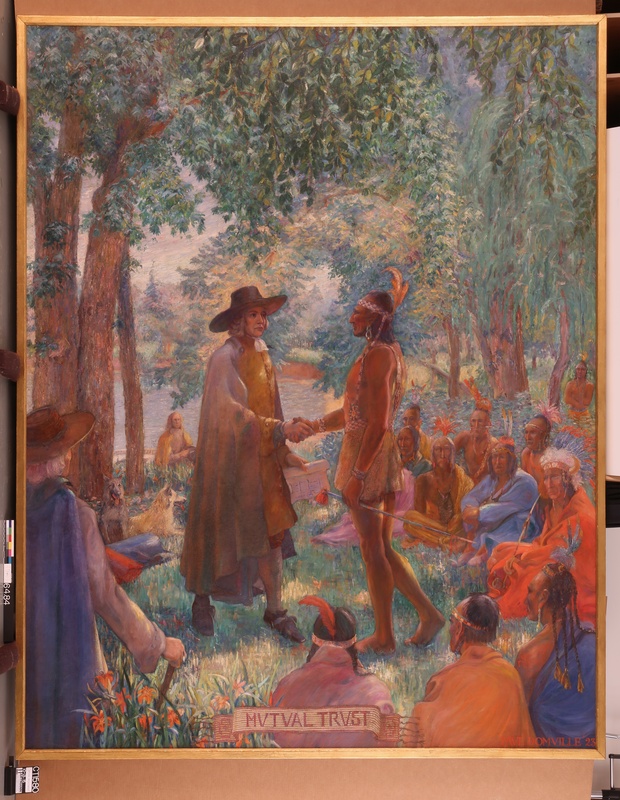 Especially heavy repainting was noted in sections including William Penn’s robes, the standing central Indian figure, the lighter colored dog, on tree trunks, and in the overhanging tree foliage. 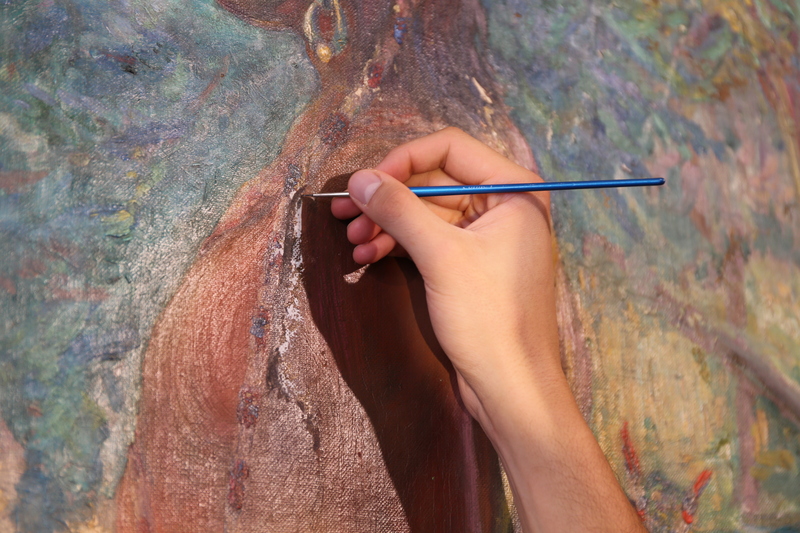 After complete surface cleaning of the painting, an isolating spray varnish coating of synthetic varnish was applied to the painting. Deep losses were filled with gesso and all losses throughout the composition were inpainted with conservation-grade paints. Following inpainting, a second surface spray coating of varnish was applied. 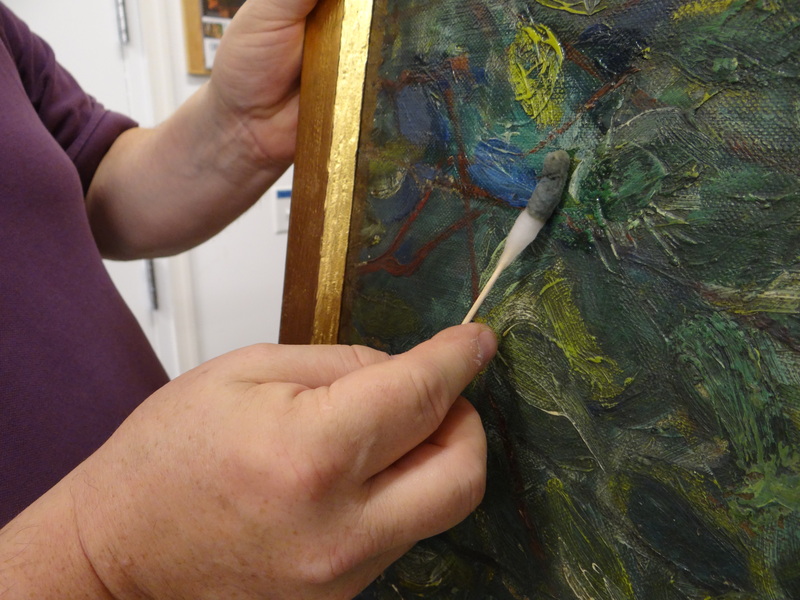 The four gilt frame pieces were carefully removed and cleaned with solvents. Areas of lifting leaf or gesso were consolidated with varnish. Frame losses were inpainted with appropriately matching mica powders in varnish, while large areas of loss were re-leafed with brass leaf. 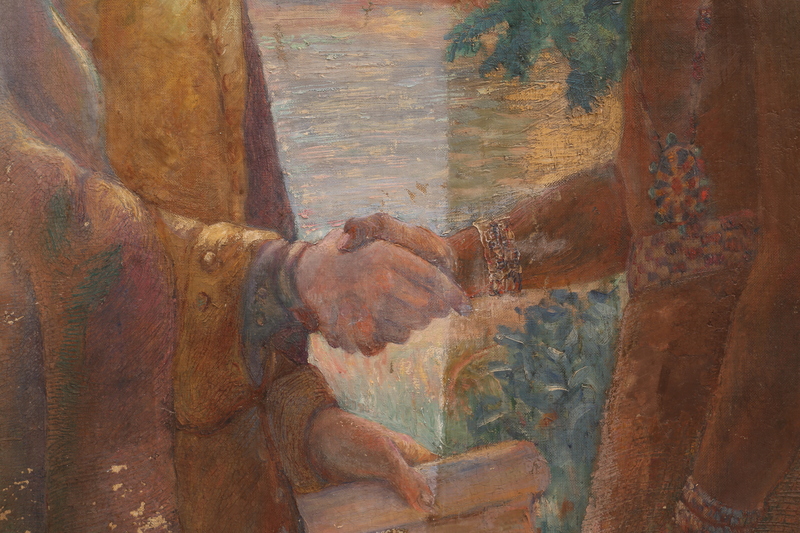 Some areas of inpainting were coated with shellac to appropriately match the original tone of the gold frame. The painting was backed with sheets of appropriate inert, stable, acid-free corrugated plastic. Original inscription labels were encapsulated in Mylar and affixed to the back of the new backing board, along with hardware strong enough to support the heavy painting. 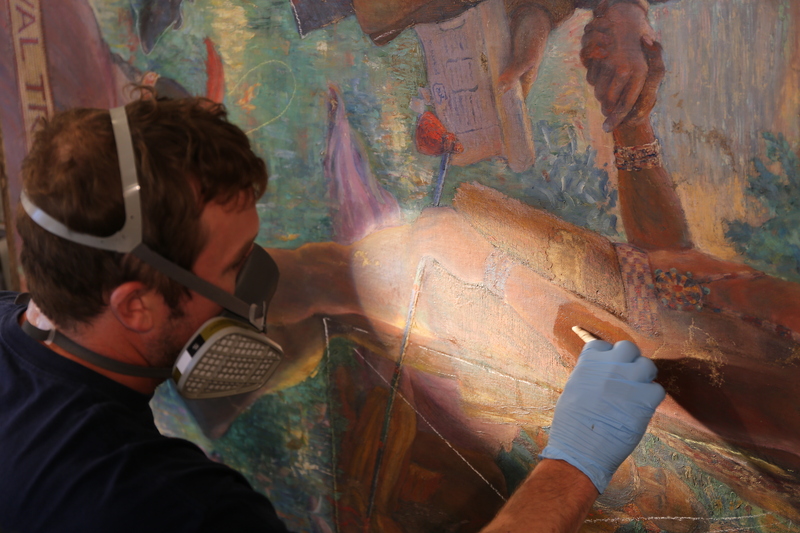 The painting was then re-wrapped using museum-quality materials and transported back to the State Museum personally by trained Hartmann Conservation staff.